Woman resting with small yorkshire terrier outdoors. Yorkie running on leash with owner on the bridge in a winter snow-covered park. Slow motion. Yorkie walk on leash with owner on the bridge. Small yorkshire terrier running with girl in a winter snow-covered park. Slow motion. 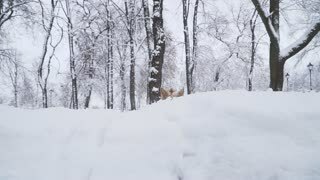 Little yorkshire terrier jumps in a snow then backs to her owner. Yorkie walking in a winter snow-covered park. Slow motion. Funny yorkie walk on leash with owner on the bridge. Small yorkshire terrier running with girl in a winter snow-covered park. Slow motion. Small yorkie walk on leash with owner on the bridge. Yorkshire terrier running with girl in a winter snow-covered park. Slow motion. Yorkie walk on leash with owner outdoors. Small yorkshire terrier running with girl in a winter snow-covered park. Slow motion.